On October 3, 2010, Workers' Party candidate Dilma Rousseff won the first round of Brazil's 2010 Presidential Elections with over 46% of the votes, and will be facing a runoff on October 31. Dilma Vana Rousseff's father, Petar Stefanov Rusev (known in Brazil as Pedro Rousseff) was born in 1900. Little is known about his parents, Tsana and Stefan Rusev, who married and lived in the town of Gabrovo in Central Bulgaria. The family had five children – two daughters – Piya and Vana, and three sons – Rusi, Petar, and Zahari. Petar Rousseff moved to Sofia at an early age where he started studying law but subsequently began trading in textiles (the town of Gabrovo, because of its many textile plants, at the time was known as "The Bulgarian Manchester"). In 1929, Petar Rousseff left his wife Evdokiya Yankova, who was in her last month of pregnancy, and went to France. His wife and son Lyuben-Kamen Rusev, did not hear from him for 18 years, which is why they long believed that he died somewhere around the world. In 1948, they received their first letter from him. Petar Rousseff's departure from Bulgaria in 1929 remains shrouded in mystery. According to Dilma Roussef herself and other sources, he was connected with leftist movements in Bulgaria in 1920s, and more specifically, with the Bulgarian Communist Party. After a right-wing coup in 1923, the political situation in Bulgaria in the 1920s was especially tense, with the government persecuting the communists and other leftists in the so called "White Terror", while the communists responded with sabotages and armed rebellions (most notably in 1923) in the so called "Red Terror", which culminated in 1925 in the largest terrorist attack in Bulgarian history, the blowing-up of the St. Nedelya Cathedral that killed 134 people. It is unclear whether Petar Rousseff left Bulgaria for political reasons, whether he was ever arrested and persecuted. His Bulgarian son, Lyuben-Kamen Rusev said his father left because his business went bankrupt. 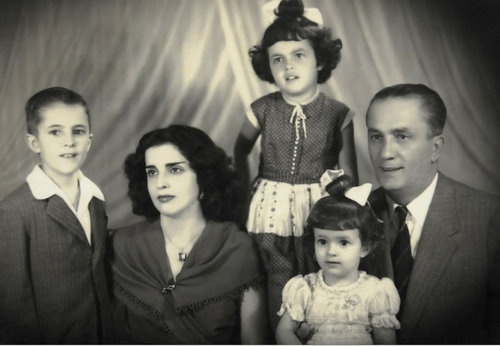 Petar Rousseff lived in France for 15 years, heading to Argentina in 1944, and shortly after that to Brazil, where he married Dilma Jane Silva, and settled in Belo Horizonte. The couple had three children – Igor (born January 1947), Dilma Vana (born December 1947), and Zana (Tsana) (born 1951). Dilma Vana Rousseff has two first names; she was named after her mother Dilma and after one of Petar Rousseff's sisters Vana, with whom he was especially close. Vana Ruseva was a middle school teacher of arts in Bulgaria; she died at 48 without ever being married. Petar Rousseff's other daughter Zana was named after his mother Tsana but in Portuguese the name was transformed from Tsana into Zana. Zana Rousseff died at age 26. Petar Rousseff was especially close with renowned Bulgarian poetess Elisaveta Bagryana (1893-1991), who he met in France in the 1930s. Bagryana, whose first book of poems appeared in 1927, and was cherished by Bulgarian leftist youth, even dedicated poems to him in the so called "Brazilian Cycle" (comprised of poems written in 1958-1963). The poem "A Handful of Snow" is specially for Petar Rousseff to whom Bagryana wanted to present a handful of snow to remind him of his native Bulgaria even though he was in faraway Brazil. Bagryana herself visited Rousseff's mansion in Brazil in 1960 meeting his wife and kids, including the 13-year-old Dilma Vana. Lyuben-Kamen Rousseff (1930-2008) is the Bulgarian half-brother of Dilma Rousseff. He never met his father, Petar Rousseff, who left Bulgaria shortly before Lyuben-Kamen was born, and his half-sister Dilma. Lyuben-Kamen became an engineer constructing several large-scale water dams around Bulgaria. However, he had constant problems with the Bulgarian Communist regime since in 1947, he joined the Bulgarian Social-Democratic Party, which was part of the Fatherland Front Coalition, including the Bulgarian Communist Party (BCP), that ruled in 1944-1948. In 1948, the BCP took over the government on its own, in the meantime persecuting the members of the other leftist formations. Lyuben-Kamen's involvement with the Social-Democratic Party scarred his life in Communist Bulgaria forever, debilitating his professional development. He was never in prison but he was saved from being expelled from the technical university in Sofia only by a favoring professor. Only in the 1980s, he was allowed by the communist authorities to work briefly in Algeria and Morocco. He was twice up for state medals but the medals were denied most likely because of his political past. After he received his first letter from his father in 1948, Lyuben-Kamen Rusev began receiving regularly parcels from Brazil, including money, with the banknotes hidden within two identical postcards glued together. He usually received USD 50-100; one time his father sent him USD 500 which Lyuben-Kamen used to buy a Volkswagen. He sent his letters to Petar Rousseff with Bulgarians traveling to Brazil pleading his father to find a way to get him out of Bulgaria and to Brazil. He learned about his father's death in 1962 from his Brazilian wife Dilma. At about the same time, he learned from poetess Bragryana that his father became wealthy in Brazil. Upon his father's death, Lyuben-Kamen asked the Bulgarian Foreign Ministry several times to be allowed to travel in order to settle the matters around his inheritance but was refused permission. At one point, through the Bulgarian Foreign Ministry he received an offer to give up his inheritance claims on Petar Rousseff's property in Brazil in exchange for USD 1 500. Lyuben-Kamen decided to accept the deal since he saw he had no other way of benefiting from the property of his father. He received the money from the Brazilian Embassy in Sofia. After he retired in 1990, Lyuben-Kamen sent several letters to Petar Rousseff's family in Brazil but received no replies. His dream was to visit the carnival in Rio de Janeiro. He and his wife had no children. Lyuben-Kamen died in 2008 in a rather bad health condition. His wife passed away at the beginning of 2010. Petar Rousseff's aunt Rayna Kornazheva-Negentsova is the wife of popular children's stories writer Ran Bosilek (Gencho Negentsov). Their granddaughter and Dilma's second cousin is Ralitsa Negentsova, lawyer, and long-time spokesperson of the Bulgarian Central Electoral Commission. Petar Rousseff's uncle Zahari Kornazhev is the father of lawyer and Social-Democrat, and former MP Petar Kornazhev, and journalist Tsonyu Kornazhev (alive), first cousins of Petar Rousseff. Petar Kornazhev passed away in 2002 but Tsonyu Kornazhiev is the last remaining first cousin of Petar Rousseff. Tsanka Kamenova is Dilma Rousseff's first cousin living in Sofia. She is the daughter of Zahari Rousseff, the youngest of the five children of Tsana and Stefan Rousseff. She says her grandmother was extremely happy when she got a letter from her son Petar Rousseff back in 1948, which included a photo of the one-year-old Dilma Vana Rousseff. Another first cousin of Dilma, Tsvetan Kovachev, son of Piya Ruseva, has passed away, but his wife Toshka Kovacheva says that when she became a bride her mother-in-law Piya presented her with a topaz for a ring that was sent to her from Brazil by her brother Petar Rousseff. At the wedding of Tsvetan and Toshka in 1956, her mother-in-law Piya Ruseva wore a dress made from cloth sent to her by Petar Rousseff from Brazil. Piya's other daughter, and Dilma's first cousin Nadezhda Hristova has been living in Canada for 10 years with her daughter Daniela. Nadezhda Hristova was married to Nikolay Hristov, son of Docho Hristov, Bulgaria's Interior Minister in the pro-Nazi Germany government in 1943-44, and one of the authors of the notorious anti-Semitic Law for Defense of the Nation. After September 9, 1944, he was killed by People's Court set up by the Fatherland Front dominated by the Communist Party. Petar Rousseff's sister Piya Ruseva herself was a member of the Bulgarian Social-Democratic Party. Her husband Vasil was jailed in a concentration camp after September 9, 1944, for his activism and involvement with the Social-Democratic Party which was banned by the Communists in 1948. Petar Rousseff's birth house in Gabrovo is no longer standing, and the spot where it once was is now a parking lot. No information about Petar Rousseff is to be found in the State Archive in Gabrovo, or in the Regional History Museum in the city.